Unlike competitive units that run at a constant speed, patented G-Flex technology allows the Generac EcoGen to run at lower speeds when household electrical demand is light. That means significantly quieter operation at normal capacity, less fuel consumption when you need less electricity, and cleaner power than competitive air-cooled home standby. Innovative Extended Run Capability oil circulation system extends the maintenance intervals by an unprecedented 5 times the industry standard by offering 500 hour maintenance intervals. 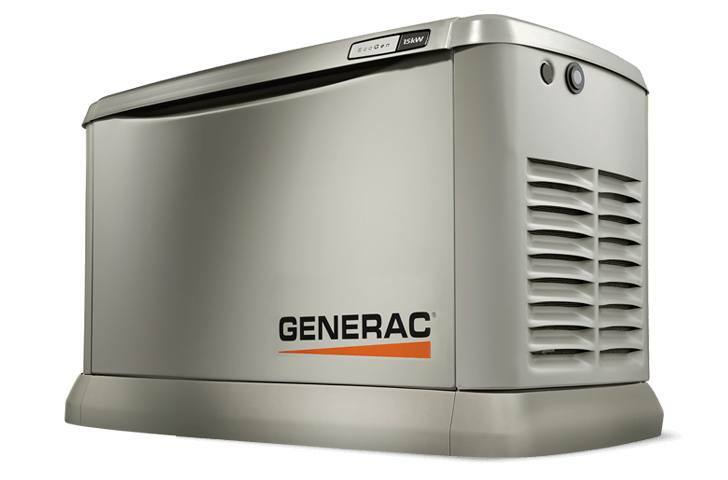 3 Year / 2,000 Hour Limited Warranty for automatic standby generators. Fuel pipe must be sized for full load. Required fuel pressure to generator fuel inlet at all load ranges - 5-7" water column (6-13 mm mercury) for natural gas, 10-12" water column (19-22 mm mercury) for LP gas. For Btu content, multiply ft³/hr x 2500 (LP) or ft³/hr x 1000 (NG). For megajoule content, multiply m³/hr x 93.15 (LP) or m³/hr x 37.26 (NG). **Sound levels are taken from the front of the generator. Sound levels taken from other sides of the generator may be higher depending on installation parameters. Rating definitions - Standby: Applicable for supplying emergency power for the duration of the utility power outage. No overload capability is available for this rating. (All ratings in accordance with BS5514, ISO3046 and DIN6271). * Maximum wattage and current are subject to and limited by such factors as fuel Btu/megajoule content, ambient temperature, altitude, engine power and condition, etc. Maximum power decreases about 3.5 percent for each 1,000 feet (304.8 meters) above sea level; and also will decrease about 1 percent for each 6 °C (10 °F) above 16 °C (60 °F).